This is my 3rd climb up a mountain, at the same time the birthday climb for a good friend - Ayie... With me are my old and new "Social Climber" friends - Ayie, Ed, Alex, Julius, Bheng, Philip, Mitch, Mart and April. Some websites say that this is just a level 1, minor climb mountain, but it wasn't as easy as I expected it to be. It took us 4 long hours hiking to reach the camp site and another 30 minutes to the summit, which we did on our 2nd day. Nakakapagod... ubos ang stamina ko... Hahaha! To my "Social Climber" friends, see you sa next climb natin up Mt. Manabu. Wahhhhh!!! Todo na 'to!!! By private vehicle, follow the route going Ternate along the hi-way known as the Magnetic Hill, passing by the entrance to Puerto Azul. 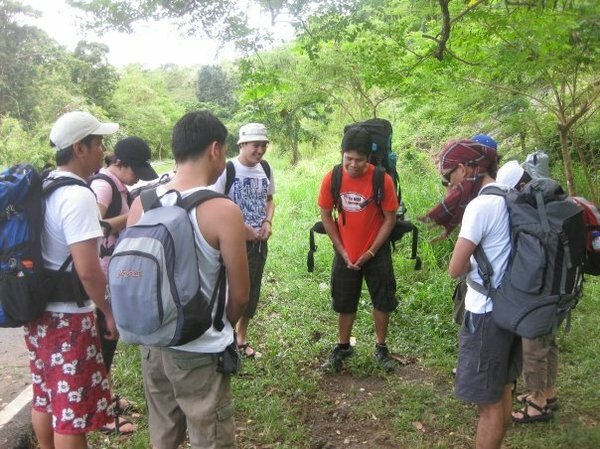 The trail starts at the DENR outpost in Ternate, Cavite. By public transportation, take any bus at Lawton/Baclaran bound for Ternate or Maragondon in Cavite. Upon reaching Maragondon, take or hire a jeepney going to the jump-off point at the DENR office. More posts on Cavite? Click here. madaanpo ba ng bus yung denr? I want to try this climb!! Hopefully next year!